Our Culture Audit© evaluates your organisation’s culture. It focusses on the HR and leadership practices that create the environment that attracts and retains talent and that is essential for businesses to remain competitive. 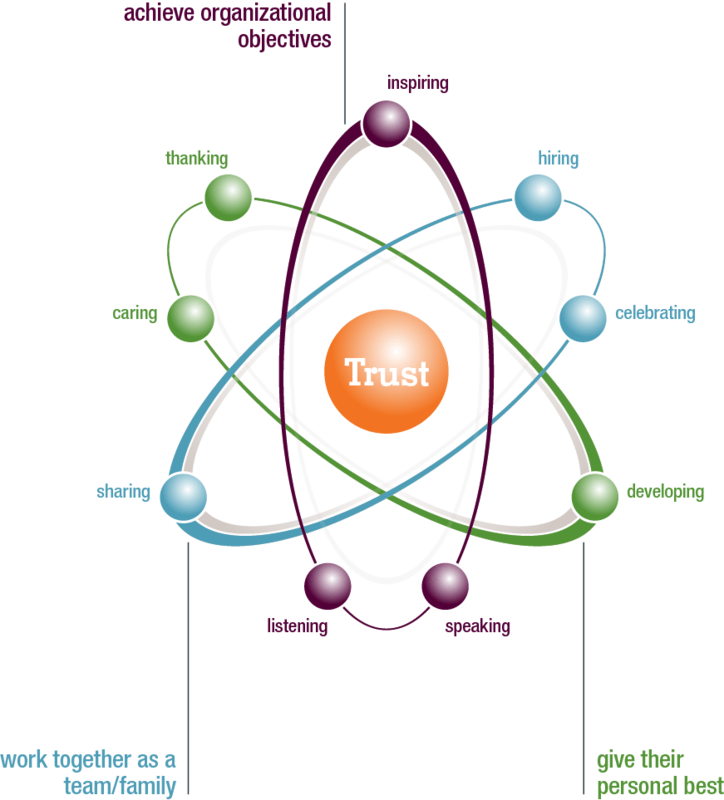 There are nine ways or practice areas in which leaders and managers create an environment of trust. Great Workplaces™ achieve their organisational goals by Inspiring, Speaking and Listening. They encourage their employees to give their personal best by Thanking, Developing and Caring. And they work together as a team/family by Hiring, Celebrating and Sharing. The Great Place to Work® Culture Audit© is split up into two parts and serves to summarise HR measures that promote an employee-orientated workplace culture. The first part of the Culture Audit© gathers demographic information about staff as well as general information about the company, such as salaries for the largest staff groups and the number of hours spent on training. In the second part of the Culture Audit©, open questions are asked about the relevant aspects of HR work essential for a successful workplace culture. This part is integral to the evaluation of employer attractiveness. The company is given the chance to present internal measures in more detail. These questions relate to 9 dimensions of successful HR management that are based on the Great Place to Work® model and that are central to the evaluation. The evaluation also focuses on the way that a company integrates these dimensions into their HR policy and encourages a great workplace culture. "The Culture Audit© is an essential tool to help steer our company in the right direction. It's like an autobiography of your organisation, and every year we expand it by including new chapters and experiences." "The Culture Audit© is comparable with carrying out 'company archeology'. It allows you to record all the visible artefacts and processes in detail. It forces you to look at the company with fresh eyes." "Because of the analysis and clear feedback from the Great Place to Work® Institute, we are able to reflect upon our culture and practices. Every year, we use this feedback to think about new innovative actions to improve our HR policies." The Culture Audit© is all about the policy in everyday practice. Many HR plans are made for the MT but employees benefit little as a result. The Culture Audit© allows you, as the HR team, to consider the experience which you wish to convey. Curious to discover what makes good employers so good? Based on the themes in the Culture Audit©, we provide insights into the successful programmes and initiatives of the Best Workplaces™. These are practical examples which serve as inspiration. Every year, we publish a Best Practices guide. Discover all the Best Practices. We use the VOAHI method in every country in which we operate. After all, good employment practices are not just based on fringe benefits or facilities. That's why we look at Variety, Originality, All-Inclusiveness, Human Touch and Integration. Many organisations have impressive programmes on paper but are failing to achieve the desired results in practice. The insights provided by the Culture Audit© help to increase the success of the policy. The insights from the Culture Audit© can be linked to the results of the employee survey to see what the effect of the organisational culture is. Employee experience is about what employees experience within the organisation, from the time of recruitment until they leave the company. This new term actually covers what the Culture Audit© has been describing for years. Bearing in mind the links with employee experience, working on the nine themes and constantly improving them on the basis of the five criteria will enable you to build the best employee experience. You can use the Culture Audit© in your internal communication to build trust and increase the sense of pride. Many organisations also use the Culture Audit© in their labour market communications. It demonstrates in a practical way what the organisation is doing in various respects, creating clarity for current employees and giving potential job-seekers a good idea of what to expect. How can the Culture Audit© support you in defining HR policies?